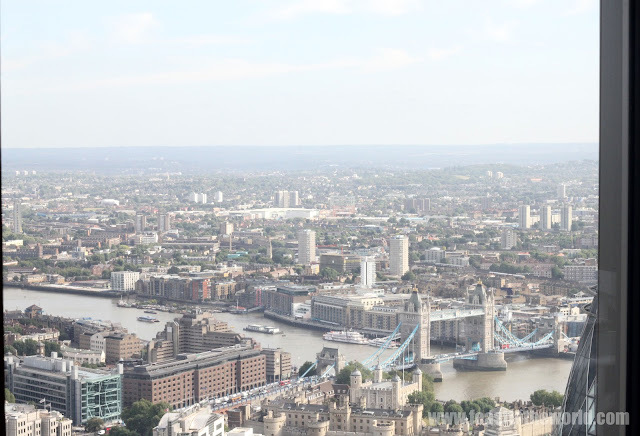 Hidden high above London city is this beautiful sparkling new restaurant. To get to it, you have to first arrive at the Heron Tower, spot the bright yellow sign, walked past the inquisitorial receptionist and then step into the glass lift (which I'm pretty sure is the same one from Roald Dahl's Charlie and the Great Glass Elevator). Once the 40th button is pressed, it shoot up at the speed of light and brings you to the desired floor in a matter of nano seconds. You walk out of the lift, all confused and disorientated, walking through walkway, greeted first by the toilets (bizarre), thinking that you have made a mistake, but nope, that was indeed the entrance. You arrived at the bar, graffiti filled wall, mosaic tiled flooring, clustered bottles lighting and an open-style bar in the middle. Through the bar and you reach the main dining room. 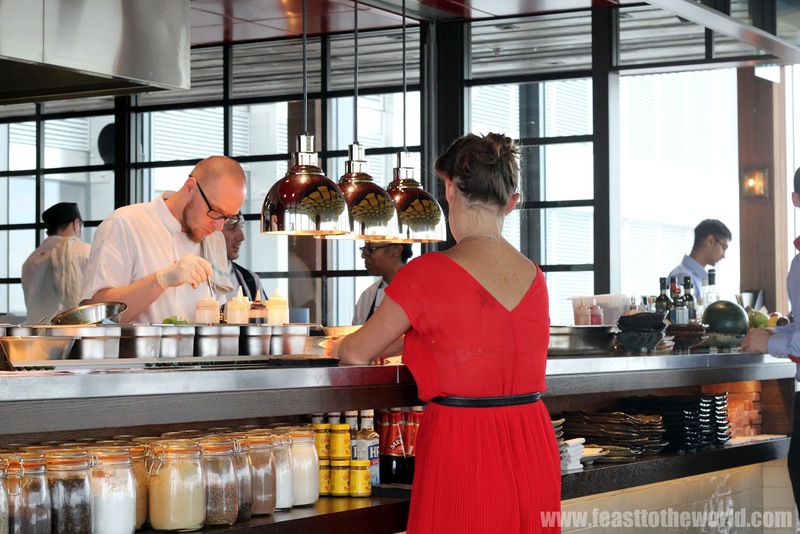 The decor is sleek - red panelled ceiling in the open kitchen and yellow waves-like layered ceiling in the dining area. Here you'll see the head Chef, Dan Doherty manning the pass with meticulous precision. The view from the dining room is phenomenal and on a clear cloudless day, the whole of London looks breathtakingly stunning. But less about the view, as spectacular as it may be, and more about the food. 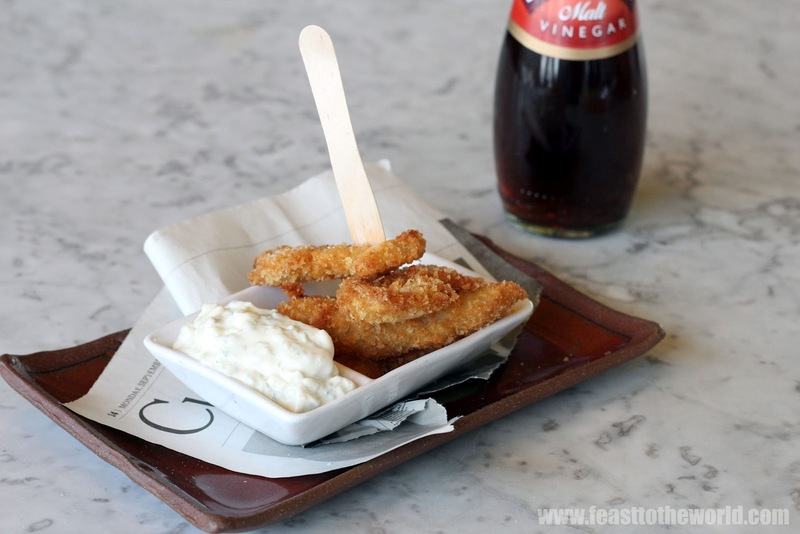 The chip shop cod tongues (£4.50) were bitesize fish fillet coated in a light and crispy batter. Served on top of some newspaper cuttings, eaten with a tiny wooden fork with malt vinegar and creamy tartare sauce on the side. 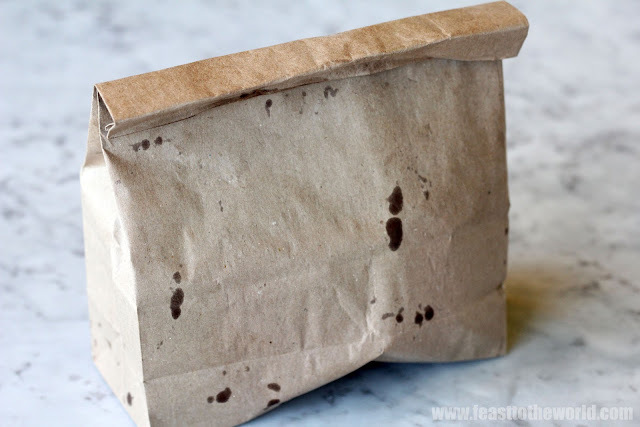 BBQ-spiced pig ears arrives in a mysterious looking brown paper bag. 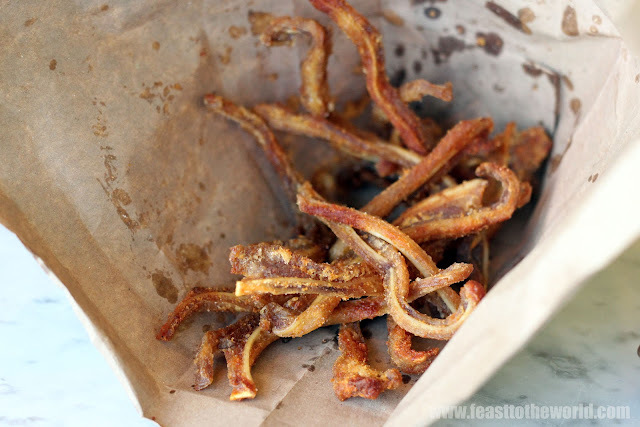 Once unwrapped, reveals strands of crispy curled pig ears. The aromatic spices coating the crunchy fries-like porcine delights, so delicious that from here forth, let this be declare as the new 'fries' to replaced those humdrum potato version. This is dangerously moreish! 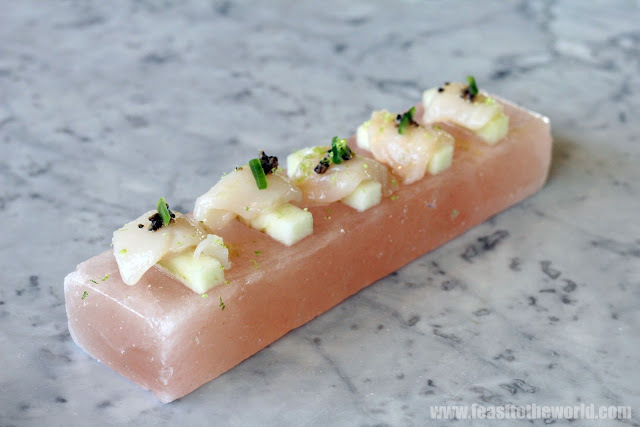 Next up, slithers of scallop, apple batons, topped with shavings of black truffle and lime (£8) on a block of Himalayan salt block. Fresh and zingy with a light added saltiness, this taste as gorgeous and it looks. Although a larger portion of scallop will definitely give a much better balance. Once the scallops are polished off, feel free to lick the salt block and order a shot of tequila on the side. (this will be ideal). 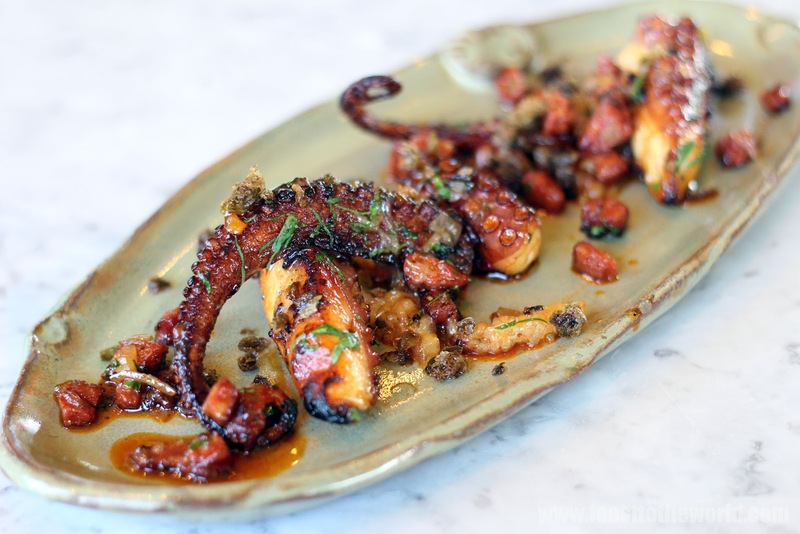 The octopus (£11) are chargrilled. 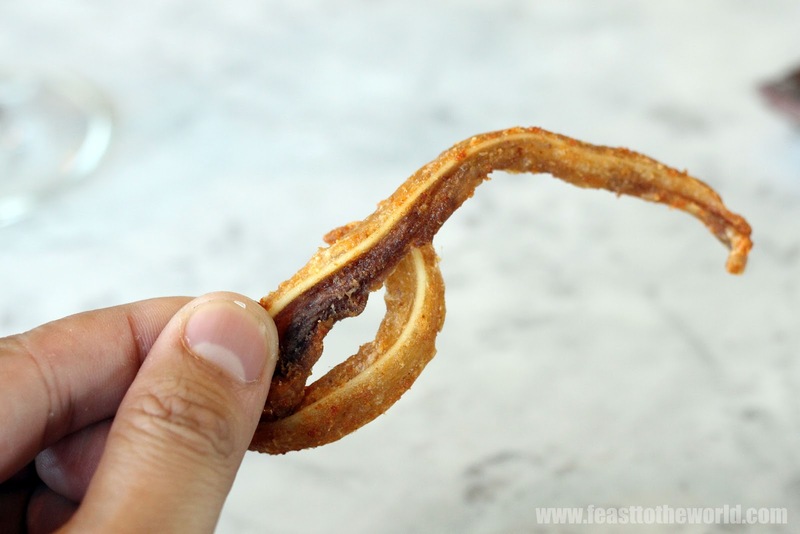 The tentacle ends are crispy, the flesh is perfectly tender to the bite. The Chorizo gives an added spicy smokey flavour the truly delectable dish. Duck and Waffle (£13), the signature dish. 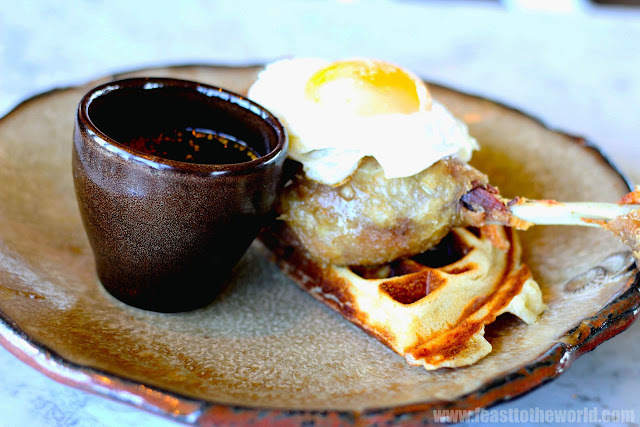 Spongy light waffle act as the cushion, then topped with roasted confit duck leg and sat on top, is the fried duck egg with a glorious runny yolk. Once drizzled with the accompanied mustard maple syrup, you have a sweet inventive concoction. A marvellous creation. Strange as it sounds, it actually reminds me of a well lacquered crispy Peking duck. 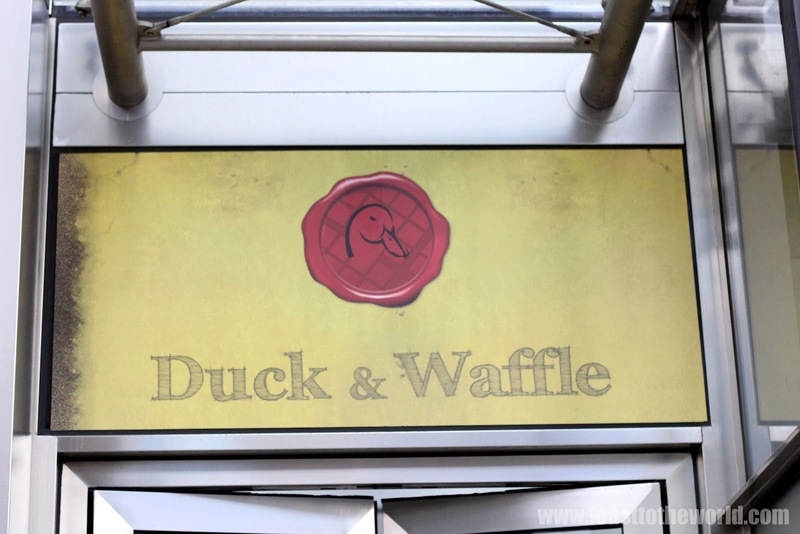 It is so beautifully flavoured that dunking the remaining duck straight into the syrup once the waffle has been eaten is the only way to go. 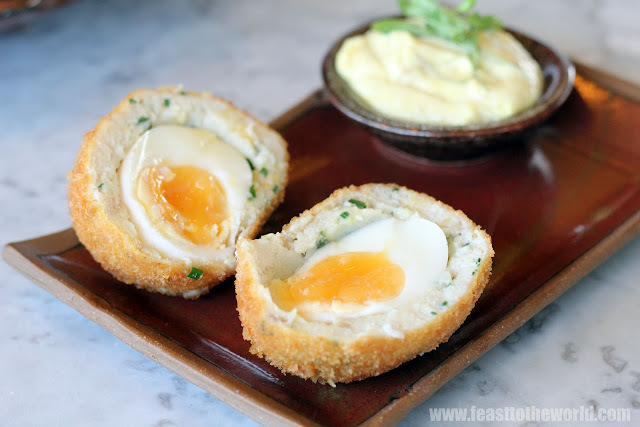 Smoked haddock scotch egg ware slightly salty. The smoked haddock paste cushioned the soft-boiled egg within. With the curry mayonnaise, this feels like a new spin on the classic kedgeree. Despite the saltiness, it is still delicious nonetheless. The pudding to finish is the chocolate brownies (£7), rich and warm with a surprise layer of creamy peanut butter sandwiched between. 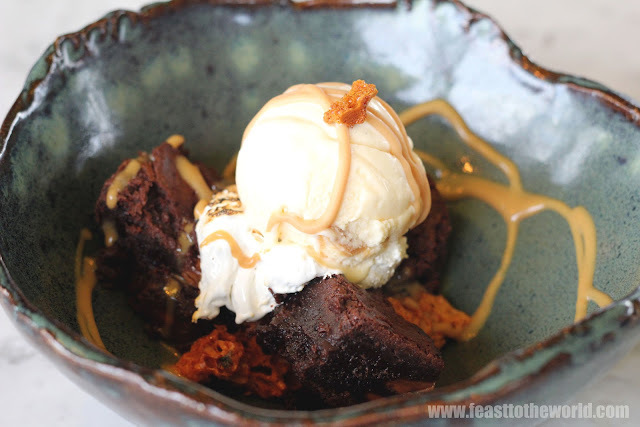 Served with peanut butter ice cream, caramel sauce and crunchy caramel brittle for added texture. Truly divine and a smooth finish. The bill arrives, a reasonable price to pay for such a wonderful journey. Now back through the bar for a few drinks if you wish and then enjoy the view on your way down in the great glass elevator. go with me again please?